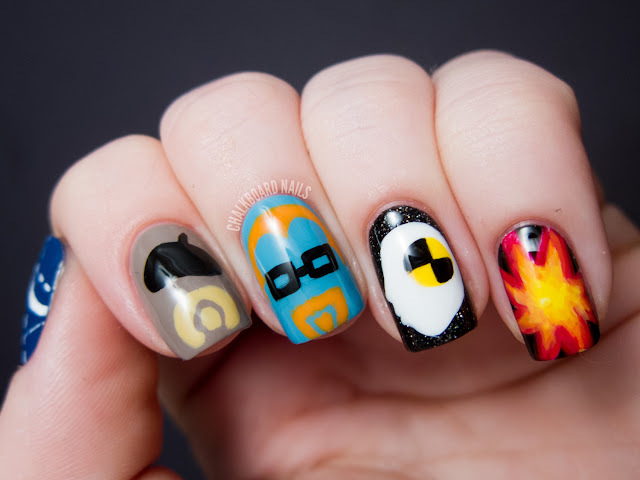 Now that I've done Adventure Time, Futurama, and Parks & Recreation manicures, I thought I'd add another one of my favorite shows into my nail art portfolio -- Mythbusters! I think Mythbusters is one of those shows that is universally well-liked. The team of people on the show is so likable, they perform awesome and informative experiments, and there are lots of explosions. 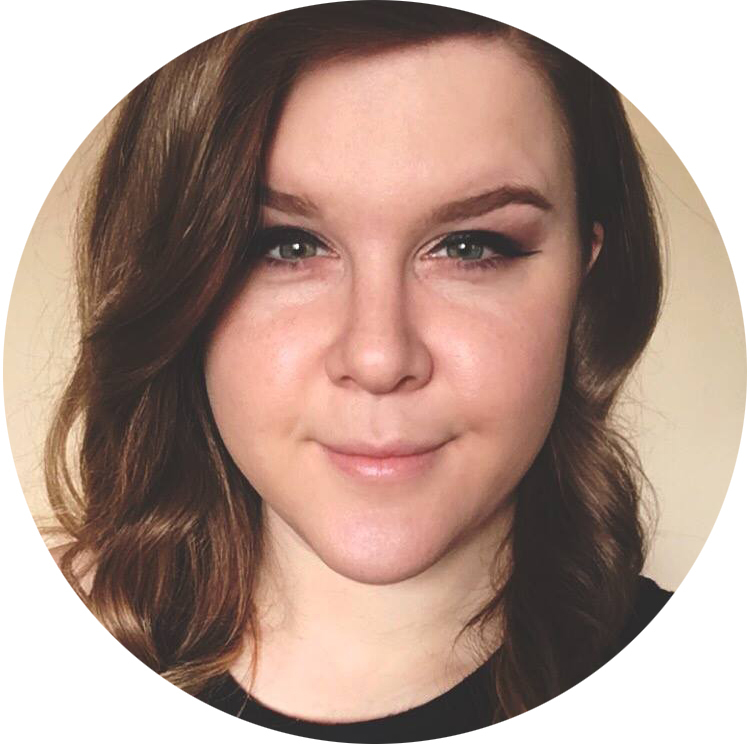 If you're unfamiliar with the show, you can watch some clips and get a feel for it on the Discovery website. On my thumb is a depiction of a blueprint, much like the ones that the show uses to explain their experiments. My pointer finger is a representation of Jamie Hyneman, through his iconic mustache and beret combo. My middle finger is Adam Savage with his thick glasses and ginger hair. My ring finger is Buster! Buster, if you are unfamiliar, is their stunt dummy. I've shown his head in profile over an asphalt-y base. Finally, my pinky is an explosion. 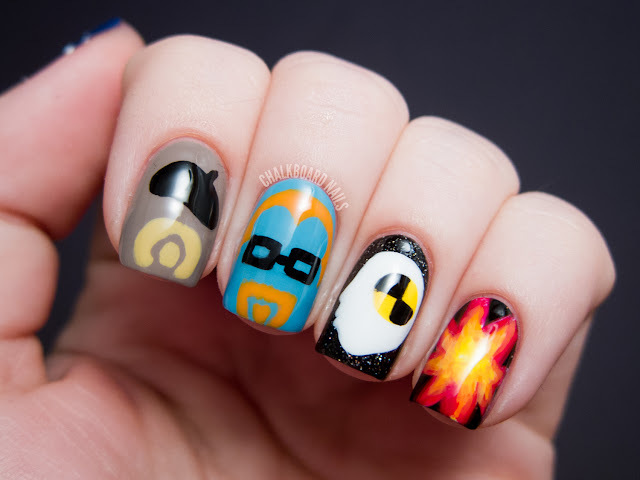 Because what is Mythbusters nail art without an explosion. There are a bunch of colors in this, and I'll type them out for you guys since I love you. The entire manicure was freehanded using a medium length striper brush. I had some trouble with the host representations. I had to redo Adam at least three times before I was happy with him, and even then I took off his facial hair an additional time to try to refine that a bit more. Jamie was easier, only requiring one mustache re-do. I think my favorite nail out of all of these would be the Buster on my ring finger. I am really pleased with the way all of these came out, though, and hope Mythbusters fans think I did the show justice! 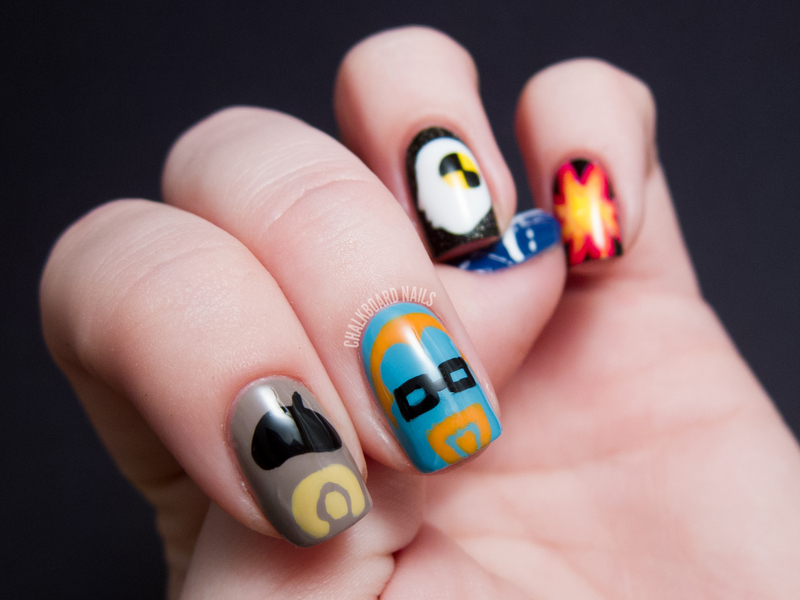 Remind me of big bang theory nails 8) Cool. These are amazing! I love this show, I think your nails defo show off the show well. My fave nails are the host nails! I wish I was that good at free-handing, you are so talented! You are amazing! These are awesome! Really great, you represented the guys perfectly!! I have to agree, your Buster nail is the coolest. Amazing AS ALWAYS! Gah I love it! My hubby does too! Yes, this turned out legitskis. Oh wow. Have you tweeted this to Adam yet (@donttrythis)? Pretty sure he'll adore it. LOL this is fantastic, the Jaime nail is my favorite and so identifiable to him. I love it! oh my gosh! Your interpretation is spot-on! I knew they were Mythbusters nails even before reading the post. Well done again! This is amazing! 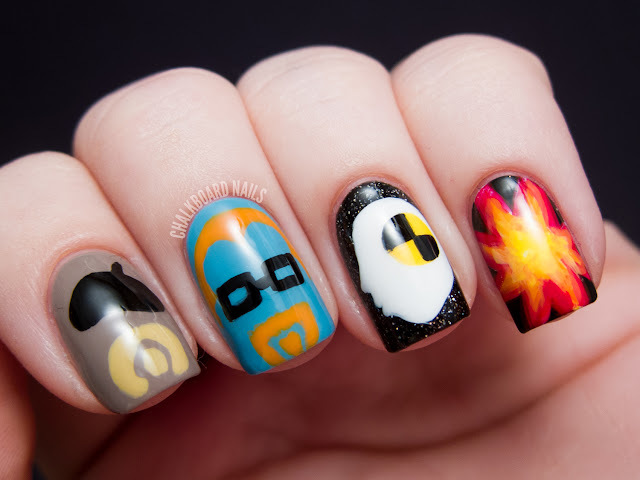 I love MythBusters and I definitely love your nails. WOW this is really amazing! you need to email them a photo of these nails! This might just be the most amazing thing I've ever seen. Everyone else can stop now, because you've won at life. AWESOME. You nailed it, what a perfect representation of the show. This is awesome! My husband and I love watching Mythbusters! :) And Jamie is def my fave, haha! this is seriously awesome. i dont watch that show, though i used to a lot when it first came out, but this is tops. one of your best for sure. 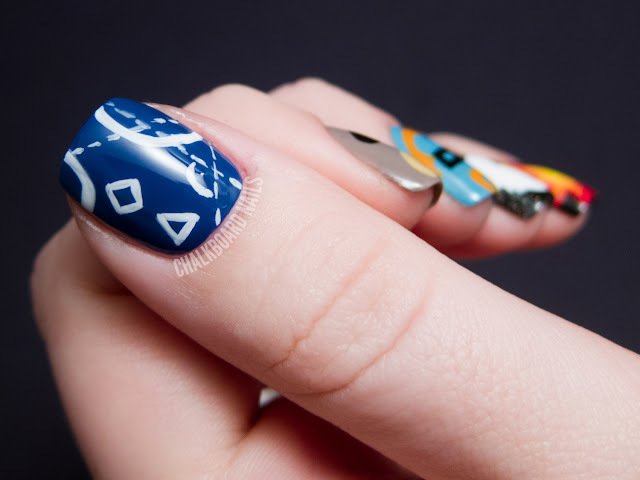 Best nail art ever!! Superb job Sarah!! As a fan, I think this is glorious!! Well done!! Like basically everyone, I love this show and your work! The mustaches are brilliant, but I really love that you got a blueprint in there! So cool! These are the type of manicures that I show to my husband and brother who have no interest in nail polish. 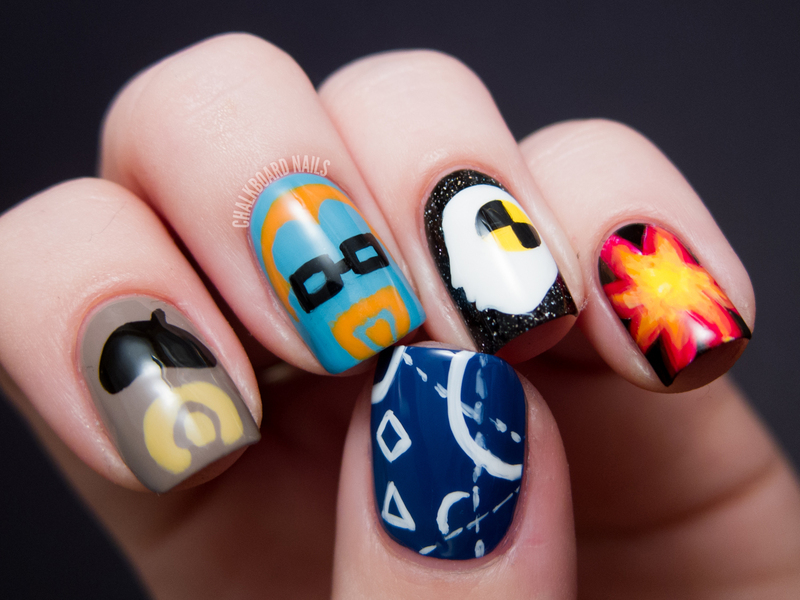 Jamie Hyneman is a cutie pie on and off your nails! hee hee Great job. These are just spot-on. Perfect. Brilliant. I could go on, but I could think of a thousand more awesome words to describe this mani. It's just !!!!!!!!!!!!!!!! Love these almost as much as the busters! This is gorgeous! So original ! Can I please tell you that my husband was slow on the pick up and I recognized it right away! Lol I was so proud of myself that I (and you) stumped him :D These are billiant, brava! These designs are so cute! 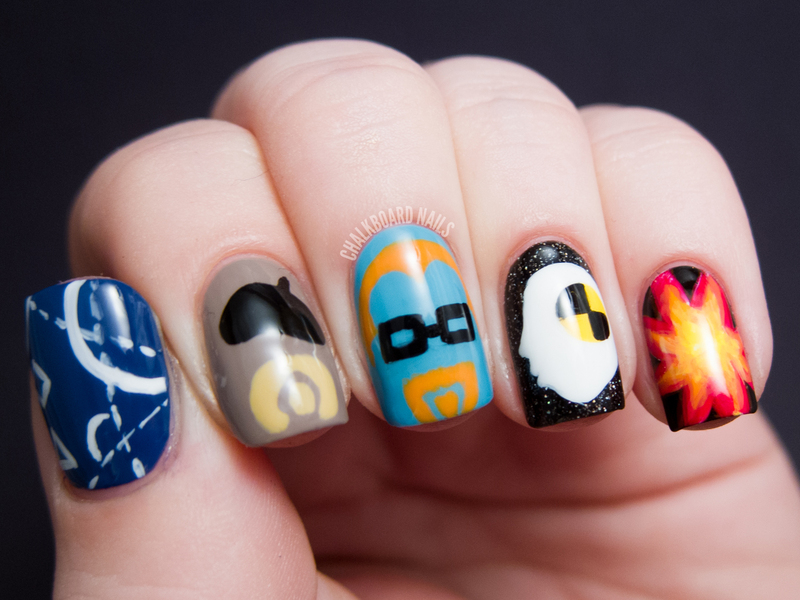 Never would have thought of a Mythbusters mani! OMG!!! I love this so much!